Former Maryland Gov. Martin O’Malley. 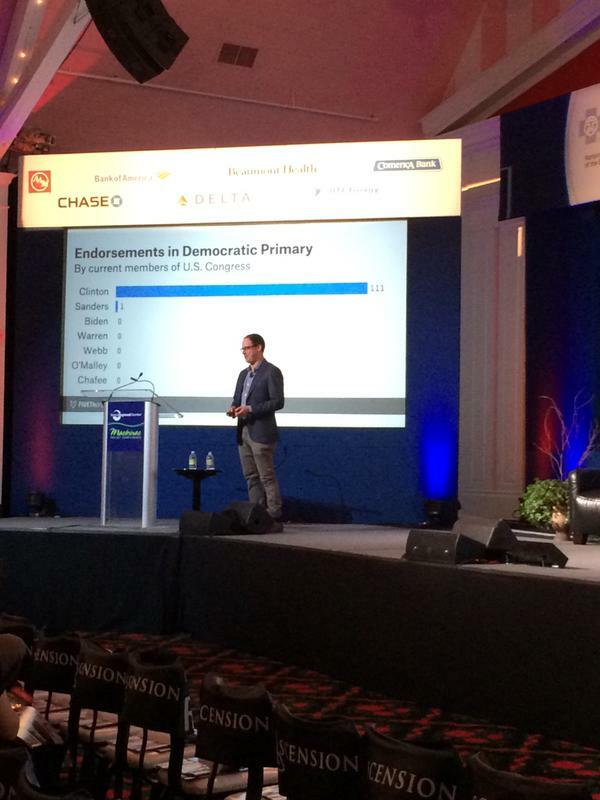 O’Malley has essentially zero support from Democratic office-holders. He’s garnering just 2 percent support in Iowa, New Hampshire and national primary polls — far worse than Barack Obama at this point eight years ago. O’Malley made some noise about running to Clinton’s left, but Vermont Sen. Bernie Sanders is already occupying that ideological space. Meanwhile, O’Malley has been attacked from the left for his policing strategy during his time as Baltimore mayor. But there’s a far simpler reason for why I’ve doubted O’Malley’s ability to compete: The people who know him best don’t like him. O’Malley is starting way down in the polls, and he’s not well known. And we have evidence that more O’Malley exposure doesn’t equal more O’Malley support. He earned just 3 percent (compared to Clinton’s 63 percent) in a poll of Democratic voters in Maryland conducted in October by The Washington Post and the University of Maryland. If this strikes you as a surprisingly low percentage for a two-term Maryland governor and former mayor of the state’s most populous city, it should. It speaks to the fact that O’Malley was unpopular enough in deep-blue Maryland that by the end of his second term, Republican Larry Hogan came out of nowhere to defeat O’Malley’s lieutenant governor in the 2014 governor’s race. 2012 Republican primary: Mitt Romney was leading the Republican field in Massachusetts in June 2011 with 56 percent, according to a Public Policy Polling survey. He also led the field nationally, but only averaged 18 percent from January to June. 2008 Democratic primary: Then-Sen. Obama was ahead of all the other Democrats at 36 percent in a January 2007 American Research Group poll of Illinois primary voters. He was in second place nationally at 24 percent. 2008 Republican primary: John McCain was in first place in Arizona with an average of 41 percent in polls taken during the first half of 2007. He was in second place nationally at 21 percent, on average, during the same period. 2004 Democratic primary: There were no early polls in Massachusetts. That said, John Kerry led in next-door New Hampshire with an average of 28 percent during the first half of 2003. He was in second place nationally at 14 percent during the same period. 2000 Republican primary: George W. Bush was at 89 percent in Texas, according to a Scripps Howard survey in July 1999. Nationally, he averaged 47 percent in the first half of the year. 1996 Republican primary: Bob Dole towered above the field at 58 percent in a June 1995 Mason-Dixon poll of Kansas Republicans. He averaged 48 percent nationally from January to June of 1995. 1992 Democratic primary: Bill Clinton led the competition at 32 percent in a June 1991 Mason-Dixon poll of Arkansas Democratic primary voters. That’s quite strong considering the poll included four major candidates who didn’t run: Lloyd Bentsen, Mario Cuomo, Al Gore and Jesse Jackson. During the first half of 1991, Clinton was in the back of the pack nationally at just 2 percent. 1988 Democratic primary: No early polling was available for Michael Dukakis in Massachusetts (or, on the Republican side, for George H.W. Bush in Texas). But Dukakis was ahead of all the other Democrats (with 32 percent) in a June 1987 Manchester Union-Leader survey from New Hampshire. Even after Gary Hart left the race in May 1987, Dukakis was in third place nationally, averaging only 10 percent in May and June. 1980 Republican primary: Ronald Reagan lapped the Republican field in California with 44 percent with Gerald Ford included and 54 percent without him, according to a March 1979 Field Poll. Reagan averaged 36 percent nationally during January to June of 1979. It’s clear that voters in candidates’ home states have been willing to support eventual nominees early on in the process, even when voters elsewhere haven’t. Increased name recognition probably explains some (or much) of the difference. But home-state support may also be a signal that voters there saw something presidential in these candidates. 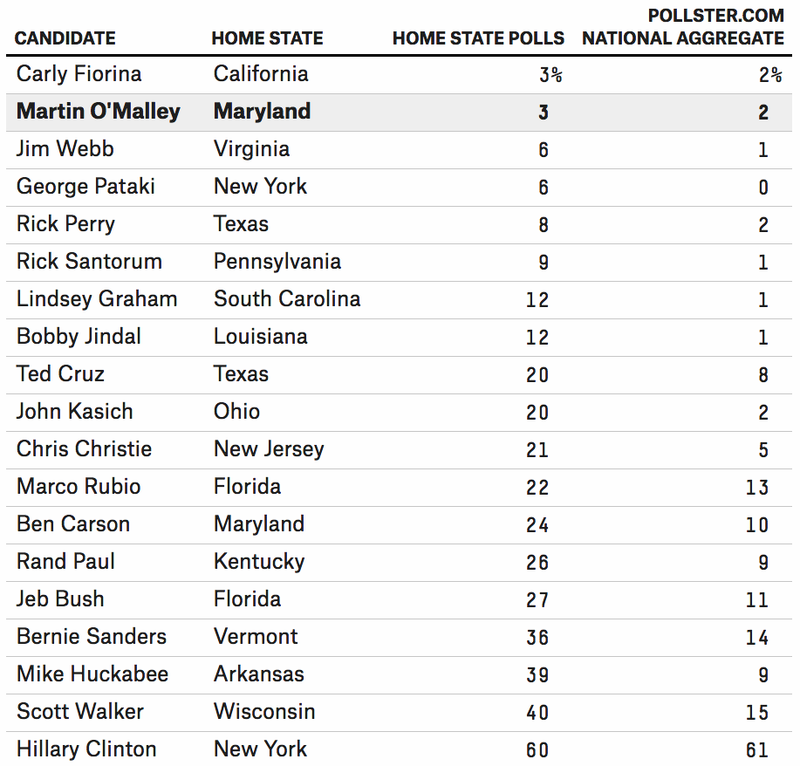 So how are the other 2016 primary candidates polling in their home states? I took a RealClearPolitics-style average of live-interview polls since the beginning of the year or, if no polls meeting that criterion were available, looked to the most recent poll in each candidate’s home state. The pattern is fairly clear: The candidates we think have a decent shot of winning their party’s nomination — Scott Walker, Marco Rubio, Jeb Bush and even John Kasich — are doing significantly better in their home states than they are nationally (with one exception: Clinton). You could debate why Clinton isn’t doing any better in New York than she is nationally. But here are two thoughts: First, she’s doing amazingly well nationally — she can’t go much higher. Second, New York is Clinton’s adopted home state; in Arkansas, she’s polling in the 70s. O’Malley, meanwhile, is at the bottom. Only Carly Fiorina matches him in lack of home-state support. Fiorina, of course, has only run for office once in California and has never served in any elected office. O’Malley’s main competitor for second place in the Democratic primary, Bernie Sanders, got 36 percent of the vote and even led Clinton in an October 2014 Castleton Polling Institute survey of Vermonters. That points to a base of support that should allow Sanders to do fairly decently in the primary, even if he has little chance of winning. O’Malley’s lack of support in Maryland may signal dark days ahead for his candidacy. Perhaps when his campaign gets going, he’ll show heretofore unseen skill in winning over voters. At this point, however, Maryland’s Democrats are telling us what every other indicator is: O’Malley is going to need a miracle in order to beat Clinton.